Hollywood sice nab�z� spoustu trh�k�, ale ne v�echny se dostanou do tuzemsk�ch kin. Je tedy na n�s, abychom v�s na n� upozornily. �asto se jedn� o velmi propracovan� sn�mky s hlub�� my�lenkou, kter� ve v�s dozn�v� je�t� dlouho po skon�en� z�v�re�n�ch titulk�. Pokud pat��te mezi p��znivce sn�mk� z 90. let, jist� si vybav�te film Na Hromnice o den v�ce. Tato romantick� komedie se stala inspirac� pro sn�mek, kter� bych v�m dnes r�d p�edstavil. Nic romantick�ho v�ak ne�ekejte. Z�kladn� my�lenkou obou sn�mk� je postava lapen� v �asov� smy�ce jedin�ho dne. V pr�b�hu filmu se pak sna�� z t�to smy�ky uniknout. Sn�mek vznikl na n�m�t stejnojmenn� knihy z roku 2010. Before I Fall je nejnov�j��m sn�mkem re�is�rky Ry Russo-Young, kter� se specializuje na nez�visl� sn�mky. P��b�h vypr�v� o mlad� st�edo�kola�ce Samant�. Ta m� zd�nliv� dokonal� �ivot. Jej� kamar�dky jsou pro ni rodinou, jej� p��tel je pozorn� a nadev�e ji miluje. A jej� rodina je jako z magaz�nu o ide�ln�ch vztaz�ch. V pr�b�hu cel�ho sn�mku pomalu zji��ujeme, �e ne v�e je takov�, jak� se zd�. Vlivem tragick� ud�losti se Samantha ocitne v �asov� smy�ce, odsouzena pro��vat stejn� den a stejnou trag�dii neust�le dokola. Nejprve se sna�� pochopit podstatu cel� sv� trag�die, ale v jistou chv�li v�e rad�ji vzd�v� a pokou�� se vyu��t tuto situaci k vlastn�mu obohacen�. V tomto procesu postupn� ztrat� sv� p��tele a rodinu. Hereck� v�kony b�vaj� u podobn�ch projekt� �asto nevyzpytateln�. Nicm�n�, hlavn� p�edstavitelka Zoey Deutch, m� i p�es sv�j relativn� n�zk� v�k bohat� filmov� zku�enosti. V posledn� dob� jsme ji vid�li po boku Bryana Cranstona a Jamese Franca ve sn�mku Pro� pr�v� on? Svou hereckou kari�ru v�ak nastartovala ji� v roce 2011. Sv�m talentem dok�zala �lov�ka vt�hnout do d�je a donutit ho se o postavu v�ce zaj�mat a sympatizovat s n�. Osud Samanthy v�m jist� nebude lhostejn�. Sn�mek se sna�� zd�raznit to, �e ka�d� na�e akce vyvol�v� ur�itou reakci. Rovn� poukazuje na fakt, �e ka�d� den m��eme pro��t jen jednou a je jen na n�s, jak se s t�mto faktem vypo��d�me. Je nutn� si uv�domit, �e tento sn�mek rozhodn� neoslov� masy lid� a nezm�n� jejich vn�m�n� okoln�ho sv�ta. Svoje fanou�ky si v�ak jist� z�sk�. Pokud m�te r�di filmy, u kter�ch je nutn� alespo� trochu p�em��let, jist� se na Before I Fall pod�vejte. Hollywood offers a lot of movies but not all of them get into the domestic cinemas. It is therefore up to us to tell you about them. Often, these are very sophisticated images with a deeper idea that stays in your mind long after the end credits. If you are one of the fans of the 90s cinema, you will surely remembered movie called Groundhog Day. This romantic comedy has become an inspiration for the book and movie I would like to present to you today. But do not expect anything romantic. The basic idea of the two images is the figure drawn in the time loop of a single day. During the movie, that person tries to escape from this loop. The film was based on the theme of the 2010 book of the same name. 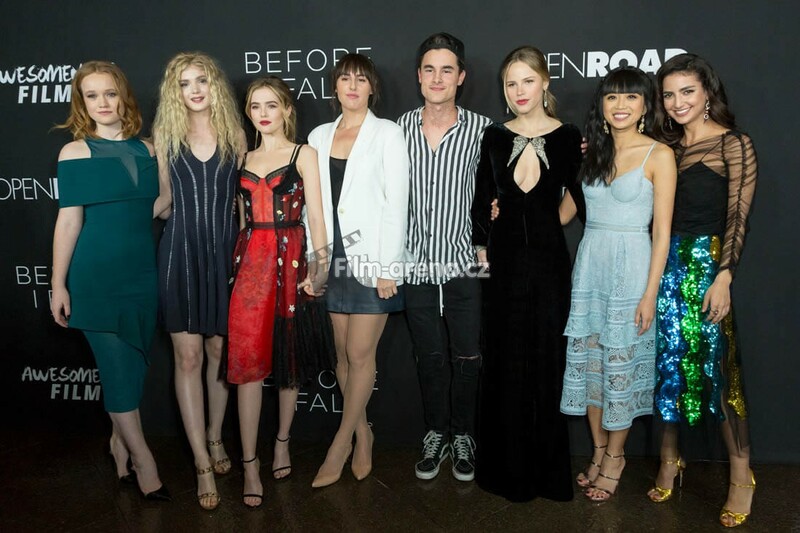 Before I Fall is the latest film by director Ry Russo-Young, who specializes in independent films. The story tells of a young middle-aged woman named Samantha. She has a seemingly perfect life. Her friends are family to her, her boyfriend is attentive and he loves her. And her family is from a magazine about ideal relationships. Throughout the movie we slowly find out that not everything is as it seems. Due to the tragic event, Samantha finds herself in a time loop, condemned to experience the same day, the same tragedy over and over again. At first, she tries to understand the essence of the whole tragedy, but at a certain point she gives up everything and attempts to use this situation for her own enrichment. In this process, she gradually loses her friends and family. Actor's performances are often unpredictable for similar projects. However, Zoey Deutch, despite her relatively low age, has a rich film experience. We have seen her recently alongside Bryan Cranston and James Franco in Why Him? She started her acting career as early as 2011. With her talent, she was able to pull a man into a plot and make him more interested and sympathetic to the character. Samantha's destiny will certainly not be indifferent to you. The film is trying to emphasize that each of our actions has a certain reaction. It also points to the fact that every day we live only once and it is up to us how to deal with this fact. It is important to realize that this film will certainly not appeal to the masses of people and will not change their perception of the outside world. But your fans will certainly win. If you like movies that makes you ting about life, certainly watch Before I Fall.